Shane Lowry kept his FedEx Cup playoff hopes alive with an eventful 67, but Pádraig Harrington and Seamus Power missed the third round cut in the Wyndham Championship in Greensboro. Harrington hit just five fairways and couldn't muster a birdie in a six-over 76 that sent him scuttling from tied 27th to 80th and out of the event under the MDF cut rule. Power was in position to retain his card in his rookie season when he started the week 123rd in the standings with the top 125 on Sunday night making the first playoff event next week but shot 74 and, like Harrington, he missed the third round cut instead. 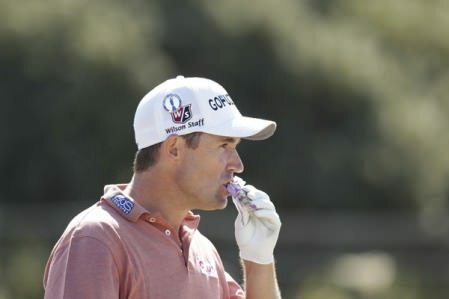 Harrington is now out of the FedEx Cup but while Power still has a slim chance of mathematically creeping back into the top 125 FedEx Cup race, it would take poor final days from several players to give him even an outside chance. Power needs five players from Harold Varner III (T6), Johnson Wagner (5th), Geoff Ogilvy (T23), Sam Saunders (T33), Lowry (T9), JT Poston (T33), JJ Henry (T23) Martin Flores (T23) to slip back and for Rory Sabbatini (T11) and Soren Kjeldsen (T9) to finish outside the top five. Tied for 66th after making the halfway cut on the mark, the West Waterford star went to the turn in two-under par to boost his chances of inside the top 125. But with the pressure mounting, he dropped five shots in a five-hole stretch from the 11th, then bogeyed the 18th for a 74 that also saw him cut under the MDF rule that reduces the field to 70 and ties if more than 78 players have made the halfway cut. It was a cruel blow to Power, who admitted last week that he has suffered too often when contending on weekends this year by trying too hard to grab the big finish he needed to keep his card. Projected to finish 130th in the FedEx Cup standings, he played well enough to keep his card with ease but didn't have the experience to pick up the big FedEx Cup points he needed on courses he was seeing for the first time. "It's all part of the learning curve," he told RTE's Game On nearly two weeks ago. "If you are in a big group near the end on the last day, there are a lot of rewards if you play well and it is difficult to block it out of your head." Had he finished in the top 125, he would be able to meticulously plan his 2017-18 season and get into some of the big events he missed this year, such as the Waste Management Phoenix Open, the Genesis Open at Riviera or The Players at TPC Sawgrass. Asked about what would happen if he finished 126th, he said he expected to get into 15 or 16 events at least, but he would not know which ones and might have to Monday qualify for others. "It would be a little more scattered," he said. "But I will get into a lot of events no matter what." Lowry's full card is safe for 2017-2018, but he wants to be in New York for The Northern Trust next week and needs to finish solo seventh or better — it's likely a top five finish would copperfasten his place — to move into the top 125. The Clara man began the week ranked 145th but briefly move up to 116th in the projected standings last night when he bounced back from a one over par front nine by making five threes in his first six holes on the homeward journey. After birdies from 17 feet and 16 feet at the 10th and 11th, he made a 13 footer for his par three at the 12th and a 15 footer for birdie at the 13th before hitting a 220-yard six-iron to seven feet at the par-five 15th. An eagle three there catapulted him comfortably into the top 125 but he then three putted the 16th from 40 feet and followed a birdie from 10 feet at the 17th with a soft bogey at the last. The Offaly star came up short of the green after a perfect drive and while he chipped to six feet, he missed the putt. As a result, he goes into the final round tied for ninth on 12 under par, which would only be good enough for 129th in the FedEx Cup standings. However, he is just four strokes behind leader Henrik Stenson, who shot 66 to lead by one stroke from Kevin Na, Ollie Schniederjans and Webb Simpson. With Johnson Wagner fifth on 14 under and Davis Love III, Harold Varner III and Rickie Werenski tied sixth a shot further back, Lowry knows he is in with a shout of a win that would seal his place the first two playoff events and move him to within touching distance of his goal of returning to the world's top 50 by December 31. A top-five would be a nice consolation prize, though it will likely take a 66 or better to get the job done and extend his US run this season for another week at least. Pádraig Harrington is preparing for a long trip to the US. Picture Eoin Clarke www.golffile.iePádraig Harrington has added the final tournament of the regular PGA Tour season to his schedule in a bid to boost his chances of teeing it up in at least two FedEx Cup play-off events.